Recently a short sketch for a Bagatelle from 1826 was identified among Beethoven's sketches for his last stringquartett op. 135. On this beautiful melancholic theme I wrote 7 variations for piano. A solemn choral theme is introduced by the celli and then gradually overtaken by the other strings and finally by the whole orchestra. This is followed by a fugato. The movement ends jubilantly resuming the choral theme from the beginning. Again a movement in classical styte on a melancholic Allegro theme which I love very much. 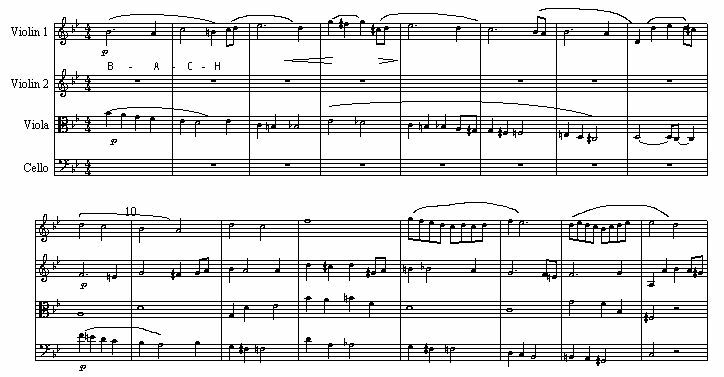 In the Coda this comes forth in a beautiful Andante variation. This is a very meditative Adagio in g minor for a stringquartett on the famous 4-note pattern B-A-C-H, on which also Beethoven in the year 1825 tried to compose a overture. The atmosphere here is of deep sadness and pain. A contrasting second theme in Eb Major, a kind of choral, rises up from this like a solemn prayer conveying the love of God. Both parts are repeated but with even more intensity of expression.